For 35 years, September meant Back to School for me. Nursery School, Grammar School, High School, College, Grad School and then...four years of teaching high school followed by eleven running education programs at professional theaters. When I was 37, I left full time employment as an educator for full time stay-at-home freelance writing, and suddenly my year didn't revolve around the educational calendar. I look longingly at shiny new office supplies, and I get weirdly organized and focused on updating my Outlook. I enter all the holidays into my calendar. Some part of me will always probably be the hybrid student/teacher, and September will always be special. September is also a weird time for food. Football is on, so I want to make chili and braise things, but it is still hot and humid, so I don't really want to have anything cooking slowly and heating up the kitchen. Despite having missed great salads and fresh veggies and juicy summer fruits and farm sweet corn during the long sad months of winter, I'm sort of bored with my summer recipes and ready to switch gears. Since I work at home, lunch is mostly whatever I cobble together, and a welcome break from typing. But Charming Suitor gets to work and gets sucked completely into his computer, and if I don't pack something up for him, it is likely he won't eat till dinner. So I'm always on the lookout for good lunch-to-go supplies. Which strangely puts me much in the same place as my pals with kids! I met the Monbento team, a lovely French company, last Spring at the Housewares show. CS and I were both taken by the simple and elegant styling of their product, a riff on the classic Japanese bento box. The other company I am digging these days is Goodbyn. 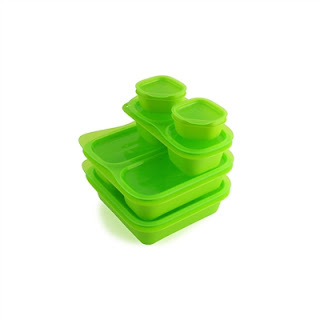 Goodbyn lunchboxes and containers, also inspired by the Bento concept, operate on very simple principles. Everything should be easy to open, so kids don't struggle. Mix and match, so you can get a variety of containers that will all stack easily together, and be recyclable so that when they have served out their useful purpose, they don't end up in a landfill. They even have dishwasher safe stickers so that your kids can customize their containers! To win, just comment below with a good back to school tip or recipe, an organizational idea, a new way to get your kids excited about carrot sticks, a delicious transitional "get out of your rut" end of summer recipe that might make some good leftovers for me to send with CS for lunch the next day! Entries must be submitted by 11:59PM on Sunday September 9, winner will be announced on Monday September 10. My favorite lunch acquisition has been a bowl and lid, with a small compartment built into the lid, for salads. I don't always pack a salad for lunch, but when I do... Seriously, it keeps the dressing sealed up until you're ready to eat, no need for tiny packets that lead to extra trash. If you mix your own, you can put the oil, vinegar, herbs, etc. in it and just shake it up. Newest De-cluttering Motto - If you haven't used it this year, trash it, donate it, or burn it. Everyone knows that de-cluttering (in all areas) = an awesome life. And if your husband asks for chicken spaghetti for dinner, buy the delicious, homemade, although not made in YOUR home option(http://www.momssecretchef.com), and call it a day! Ohh.. this is my first year as a lunch packing mommy, though I have been looking forward to packing them for years! I am all geared up with bento and laptop lunches, but I have been eyeing the goodbyn lunches for ages. 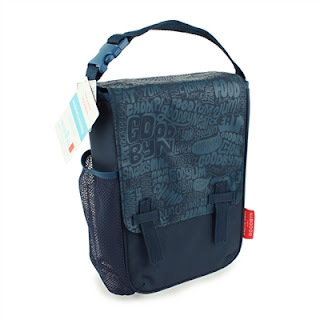 I do not 'need' another lunchbox, but I avariously want one! The end of summer has my container garden going crazy with jalapeños and tomatillos, so many of my recipes currently involve one of those two things. "Jalapeño Popper" stuffed chicken breasts, pulled pork with roasted tomatillo salsa verde- Rick Bayless' recipe, because obviously! (on a crusty sandwich roll for the hubs, on a thin corn tortilla for me)oh and a new football snack... Jalapeños stuffed with pork and cheddar and wrapped in bacon. YUM! But, I'm dying to whip up stew, chilli, roast... anything fall like. With the temperatures dipping a bit this weekend, I may venture into some fall cooking! We have some little one cup containers that have a little freezable ring that snaps into the lid to keep contents cold. Great for grapes, cherries, etc. OMG! I was just looking at Bento boxes this morning! (When I was , um, supposed to be working...) These look great. Would love a chance to win - but I'm definitely going to take a look at the websites! My best tip for getting kids up in the mornings is to buy them a battery powered alarm clock and don't show them how to turn it off! My kiddos are in Kindergarten and 4th grade, and they both know how to hit snooze and then bring me the alarm clock so I can turn it off. After they're out of bed, they have to run to the bathroom and going back to sleep just isn't happening after that. Can't wait to see the other ideas and recipes that people share! For a quick, after school snack, spread peanut butter (or whichever butter your child can eat) on a tortilla, top with sliced bananas, apples, or raisins. Roll it up and chow down! Really delicious lunch idea...sliced turkey, lettuce, tomato and hummus spread inside a wheat tortilla, rolled up! YUMMERS! Also, I made a delicious dinner last night...tilapia fish tacos with cabbage slaw (shredded cabbage mixed with a dollop of mayo, tons of lime juice, cumin, salt and pepper) Bake that tilapia, stuff it in a corn tortilla, and slap some slaw on top! WOOOOOO!!! Also, for lunches, my favorite right now is baby spinach, craisins, sliced skinless cucumber, feta, grilled chicken, slivered almonds and an oil and vinegar dressing. Makes my tastebuds SING! When I was little, my mom made me pick out the clothes I wanted to were to school the next day every night before I went to bed. She would approve them then and then never had to fight with me in the morning or worry about the morning schedule getting delayed due to wardrobe issues (or the sudden realization 10 minutes before the bus pulled up that I had no clean socks). As an adult, I still do this. Before bed I hang the outfit for the next day at the front of the closet and get to snag a few extra minutes of sleep rather than hating my clothes--not a bad way to start the day. I have my boys pack their lunches the night before and also pick out their clothes. It gives them that extra 20 minutes of either sleeping in or cartoon time that they want and also makes me not so crazed too. I am also a big beliver in meal planning for the week. It is still really hot here in So. Cal. We are still grilling outside 2-3 days a week for dinner so that is nice but I am ready for fall to arrive. Don't let the kids totally dictate what goes in the lunches! Give them a choice between a few good things, but don't just say, "What do you want for lunch tomorrow?" Makes your life much easier. I don't work for this company, but since most of my day has to do with email and this was one of the best and easiest ways to get my day under control, I wanted to share. I have changed the way I use this program, but this was a good start. To get my kids to eat their lunchbox veggies, I include a leftover package of ranch dipping sauce from their fast food chicken nuggets. That McD logo really helps to get them to eat pretty much anything!! Love the bento boxes. I might actually bring my lunch more often if I win. As to tip - I don't have kids but I did come across a great recipe that would make a good lunch. I made the tomato corn pie from smitten kitchen.com it cooks up great and is wonderful at room temperature. I teach college, which gives me an erratic teaching schedule that changes from term to term. This year, I decided to use a different calendar: instead of days being listed vertically, they're listed horizontally across the page, so 2:00 is on the same line across two pages of the calendar. This allows me to organize my day in an almost graphical way. I've blocked out my classes for the whole term, and recurring gigs (like my coffee klatch). Now I can see when I have big chunks of time to fit in reading, research, and writing. So far, I'm loving it! I also just got "Good Enough to Eat" in the mail today from Amazon, so I know exactly how I'm going to fill some of those hours!!! I've started using the reusable snack bags that I got a bunch that were food safe from etsy. Find my 20 month old son eats more if he gets to have the control and the velcro opener is easier for him to handle. Love the lunchboxes!! We love to make a simple veggie salad for lunches. Anything we grow in our garden, cherry tomatoes, cukes, etc. gets cut up and covered with dressing, and a sprinkle of parmesean cheese. Easy and healthy! I work at a major Division I university, so I dread back to school. I pack my lunch mostly everyday, and I love putting different meats and veggies in wraps. It's easy and space-saving. We only have one small fridge to share with the staff, faculty, and graduate students in our department. That's 1 fridge for about 150 people! After a nice summer of sleeping in, we start getting up at the time we will for school days a week ahead so we can all be in a new rhythm. We prepare lunches the evewning before as much as we can and finish the assembly in the morning. It saves time and eliminates some of the back to school stress. One thing I did a lot as a kid was pack a lunch, get to school and realize I'm not really in the mood for that, or wish I had this over that. For my daughter, she gets lunch and a "snack" in the afternoon. I pack it all into a lunch box. She gets a milk or juice and a water. She gets a variety of items to choose from and she gets to pick when to eat/drink it. I usually throw in an extra item to give her more options. She brings home 1-2 things every day from school that she didn't eat that day that gets "recycled" into the lunch box the next day. It's always different stuff, so it's not like she just really dislikes one thing. This not only gives her options when her mood for a certain thing changes (kids have bad days too! ), but it also teaches her portion control (which is one thing I struggled with). She just stops when she's full, which is awesome! Use cookie cutters to cut up your kid's sandwiches. This works especially well if they aren't a fan of crusts. It makes them fun to eat and my kids look forward to their surprise sandwich at lunch time. Also, we freeze whatever we can - grapes, gogurts, etc. They help keep everything cool and by lunchtime are thawed out enough to eat. Thanks Stacey!! These are great products to showcase. My kids elementary school had a contest to reduce the amount of waste that was generated during lunch hours and challenged us parents to find better ways to package lunches so kids weren't throwing away all sorts of plastic water bottles, boxes, and plastic zip bags. This promted me to revise the way I was doing things an am proud to say, my kids have no waste from their lunches. Love the Goodbyn items and they would fit right in with what I have already started. Thanks again for the share! I have been making bento box lunches for my 10 yr old for 2 years now. I love the box systems you shared! I have been using tupperware and silicone muffin cups so this would be a huge upgrade! My favorite back-to-school organization tip: I make labels for all of my son's school supplies on the computer. I use the large mailing labels, so his name is easy to read, and download the school logo from its website to show his school spirit! My best Back to School tip is to get as much ready at night as you can. I have my coffee maker timer set, lunch packed in the fridge, clothes picked out, and the makings of my breakfast smoothie ready to blend. After I make my kids' beds I lay out their clothes for the next day and get their bathroom shower-ready. This helps make bedtime and mornings go more smoothly. My best tip for lunches is to have everything ready for the week. I put cut up fruits & veggies, crackers, nuts etc. in different baggies/containers for each day of the week and have them in the fridge so when I pack the next day's lunch everything is already ready. I just want to say how much I loved Off the Menu. Great read. As soon as it's not unbearable hot, I make beef stew or chicken and dumplings or mac and cheese and freeze it for a day when it's cool enough to enjoy (after stealing a bite or two, of course)--even just being able to cook fall and winter foods is enough to break the rut! As soon as I get all my syllabi from my classes, I put all important dates (tests, quizzes, days off, due dates, etc.) on my monthly calendar. Then I highlight them with pretty colors :) It gets a little overwhelming when I look at my calendar but I like to know what my upcoming weeks look like. It just helps to stay extremely organized when you're in an intensive graduate program like I am. I love my highlighters and calendars! As a substitute teacher, I have a different schedule just about every day. But if I take enough "good" food to last throughout the day, I can get through the toughest schedules. Good food is fruit, cut up veggies and other low calorie snacks. Otherwise, I come home and eat whatever I can find, which isn't a good idea for anyone. Back to school is always a great time to get a few new packable sandwiches worked up. I love to change it up and add unexpected things, like thin apple slices in a pb&j, sprouts with my tunafish, hummus instead of turkey slices, etc. Sandwiches are great for lunches, but get so boring so quickly it's just fun to mix and match ingredients to make new things. Even as an adult with no small children. Its hard to come up with lunch ideas. I try to weigh and measure all my snacks at the beginning of the week, and then try to remember to actually take it in the am. There is still nothing better than cild meatliaf sandwich.